People with learning disabilities are thought to be more vulnerable to mental health issues. This can be for several reasons; their psychiatric illness may be directly as a result of their disability, or due to their circumstances, and in some cases, previous or current lack of access to psychiatric services. 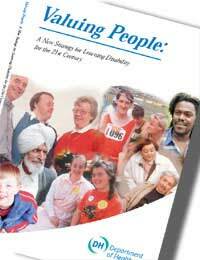 The UK Government has, however, addressed the issue of the high incidence of mental health problems in people with learning disabilities in their white paper Valuing People, 2001. The result of this has been a marked improvement in access to services and treatment for people with learning disabilities who have additional mental health issues. It should be noted that there is a distinct difference between a person having a mental illness and a learning disability, although the two may often be confused. Mental health problems are inappropriate feelings and behaviours that usually (although not exclusively) develop after childhood, and can change over a period of time and may only last temporarily. Learning disabilities, on the other hand, almost always permanently affect intellectual function and are usually evident from birth or early years, due to genetic anomalies or damage to the brain. Mental health problems can occur in people with learning disabilities for a number of reasons, and there is much debate as to the exact causes of these problems. People with learning disabilities may experience mental ill health in ‘episodes’. These episodes can vary in severity and length of time. However, if the mental health issues are identified, often the symptoms and causes can be treated with medication or other psychiatric interventions, such as psychological help and counselling or complementary therapy. People with learning disabilities may be more vulnerable to suffering mental health issues due to health, circumstantial or societal factors. For instance, some symptoms of certain learning disabilities may also commonly feature mental health problems such as schizophrenia. Social exclusion, depression and stress, as well as increased vulnerability from attacks and abuse, are examples of societal and circumstantial situations where a person with a learning disability may develop mental health issues. In addition, people with learning disabilities may not be able to appropriately communicate their problems and feelings, leading to misdiagnosis or further problems. They may commonly exhibit challenging behaviour, and negative changes in behaviour may be overlooked or misunderstood. The key is to empower people with learning disabilities – especially those with severe or profound learning disabilities – to be able to communicate their feelings more easily. Distress and unhappiness may often be overlooked as part and parcel of the symptoms of a learning disability. It is therefore imperative that therapies and activities that help people express and communicate their true feelings are undertaken to give them frequent opportunities to convey or explain their feelings and behaviours. This kind of advocacy enables carers and family members to assist in these activities so that they are able to pick up on and understand any problems that arise. They, in turn, will be able to help healthcare and psychiatric professionals in diagnosis and treatment. Valuing People has also expressed the importance of linking up local services and programmes, particularly mental health services and learning disability services. This is because there is still currently a distinct lack of a specific learning disability and mental health initiative in place in local authorities throughout the UK. The needs of people with learning disabilities who also experience mental health problems are multifarious and often complicated, and as a result it is difficult to place and refer them appropriately. This is why groups such as Mental Health Foundation and the Foundation for People With Learning Disabilities are so vital to developing initiatives and advising on mental health care initiatives. By engaging and working together with such foundations and organisations, there are ongoing reviews and new policies constantly being developed to meet the needs of people with learning disabilities.